Revolution is an interesting television drama, that takes place 15 years after a unique apocalyptic event that caused the power to completely turn off planes fell out of the sky cars quit working planes fell out of the sky trains quit running anything with a power source based on electricity quit working altogether and no one knows why and although it would stand to reason that someone somewhere would be able to think up and construct an alternative power source and get the world up and running as normal. They can't and therefore society has melted back into its agrarian past hunting fishing and gathering and farming and banding together in small communities to survive. The world of the show has broken down into various small republics that are controlled by local warlords and other educated individuals did manage to get a significant group of followers and stockpiling of weapons and food etc. the basis of the show is this Charlie (Charlotte) Matheson is on a quest to retrieve her brother that was taken by the Monro Republic militia. The Monro Republic is a republic in which Charlie resides, and her brother was taken in order to coerce her father into working with the the Monro Republic leader who believes that Charlie's father, who used to be a professor of mathematics and biomechanics knows how to turn the power back on, and with this knowledge under his control he could room on only his Republic but the United States, and maybe even the world. Charlie is accompanied on this quest by her uncle, Miles per father's best friend and her father's girlfriend although this endeavor may seem straightforward in action is becoming anything but as our band of travelers are being pursued by bounty hunters are encountering less than scrupulous travelers and other unsavory individuals, all while trying to catch up to the militia guards that are transporting Charlie's brother Daniel before they reach the Republic headquarters. A few of Charlie's companions are harboring secrets of their own that could either be helpful or detrimental depending on the disposition of the individual carrying the secret. This particular serious is a rather entertaining and engaging science-fiction apocalyptic adventure. That brings forth some intriguing ideas as to the state of the world. If the power grid and everything connected to it that we take for granted on a daily basis, ever shut down for a considerable length of time. There is plenty of action and dark conspiracy theory centered drama to be found with serious. That is sure to keep the viewer on the edge of their seat. Miles, Charlie, and Monroe need to come up with a plan to prevent a war between California and Texas. After the President gives Truman more authority, he orders a mustard gas attack to kill Miles and Monroe. As Miles, Monroe, Charlie and Connor rush to escape Austin, a confrontation with Texas Rangers divides the group. During her search for Miles, Charlie encounters Neville who demands to know where Jason is. Frustrated with Neville, Jason shares vital information with Miles instead. Using that information, Miles and Monroe head to Austin to thwart the Patriots' plans. While Dr. Porter and Miles journey into Willoughby in search of allies within the town, Monroe uses an opportunity to surprise the Patriots. Neville's political agenda put him and Jason in serious danger, as Aaron and Priscilla continue on their quest. Upon their return to Willoughby, Monroe, Charlie and Connor discover the Patriots' reeducation center is in full force; Rachel and Miles clash on how far they're willing to go to take down the Patriots; Neville and Jason discover a new ally. Aaron wakes up living in a world with power where he's running his company and he's married to Priscilla. He begins seeing familiar faces and realizes something isn't right. The nano code continues to cause tension between Aaron and Priscilla. Miles questions if he can trust the person he has in mind to take down the Patriots. Monroe leads Connor and Charlie on a risky mission, as Miles and Rachel keep watch over Willoughby. Meanwhile, Neville gets a new assignment and Aaron reunites with an old comrade. When Gene agrees to assist the town of Willoughby, Rachel and Charlie feel the urge to help too. Miles and Monroe continue to work together to survive. Monroe is treading in unfamiliar territory and must make a choice about his son, while Neville and Julia continue to tango at Jason's dismay. Meanwhile, Gene leads Charlie to an uneasy discovery. While Miles leads Monroe and Rachel south of the border, they are met by something they could have never prepared for. Meanwhile, Neville and Julia become involved with a different plot. Rachel and Gene's relationship continues to be strained as Charlie tries to prove her maturity. Meanwhile, Neville gives Jason a determined proclamation. The group attempts to escape their current situation. Meanwhile, Charlie is affected by Rachel and Gene's relationship. When Rachel discovers unnerving truths, Miles steps in to protect those he cares about. Meanwhile, Charlie shares a moment with her mom as Neville and Jason continue to clash. While Charlie, Rachel and Gene continue to be suspicious of Monroe's true allegiance, Miles is tired of trying to figure out his former friend's intentions. Meanwhile, Aaron continues to have visions that lead to endless questions. The family finally reunites and Neville saves a Patriot. The Texas Rangers visit Willoughby. Neville's manipulation of Patriot power brokers makes Machiavelli appear angelic. Meanwhile, Miles and Rachel's wounds improve, but Rachel's curiosity and heightened awareness could undo everything. Rachel courageously attempts to rescue Miles and to escape with an ailing Tribesman's wife, while Neville and Jason are assaulted by violent refugees. Charlie and Adam disagree about what to do with Monroe. Miles's life is threatened as he finds himself in the hands of Titus Andover. Charlie is determined to find Monroe, as Rachel and her father, Dr. Porter desperately attempt to revive Aaron. Meanwhile, Neville plots to infiltrate the Patriots. Episode 1 - Born In The U.S.A. The second season opens after the power was turned on. But at what cost will the people have to pay for their actions? Miles, Charlie, Nora and Aaron get inside the Tower but shut out Tom Neville and Jason. Meanwhile, Miles and Monroe face off once again. Nora is in captivity, tortured and left for dead. Monroe learns of Rachel's attempt to reach the Tower but is unaware of what she has in store for him. Things start to heat up for two couples until a disastrous drone strikes from the Militia. An assassination attempt on Monroe heightens his paranoia and Georgia Federation President Foster considers surrender. Miles and Tom Neville find themselves on the same team, but Miles still doesn't trust him. And Charlie, Jason and Nora attempt to pull off a daring river rescue of Dr. Stephen Camp to keep deadly anthrax out of the hands of Monroe. Meanwhile Rachel and Aaron are captured and threatened by Militia forces. When the past comes back to haunt Miles and Monroe in the form of mutual heartthrob, chaos ensues. Meanwhile Aaron's life is turned upside down while accompanying Rachel on her tenacious trek to the mysterious Tower where she plans to restore the power. Paranoia strikes Monroe severely when Neville disappears and Neville's son Jason makes an unexpected decision. Neville faces danger and difficult decisions; Monroe disowns his son Jason and gets captured by Miles. Rachel and Charlie try to reconcile only to be pulled apart again as Rachel suddenly embarks on a quest to restore the power and her self-respect. A final act of heroism by one of their own preserves multiple lives, but also leaves everyone feeling devastated as they are forced to carry on. Miles leads the rebel squad out of Philadelphia to safety. Meanwhile, an ashamed Rachel tries to redeem herself by providing power to the rebels, but once again must leave her children, Charlie and Danny, behind. During their mission to rescue Danny, the time has come for Miles and Monroe to meet face to face. So close to seeing her brother, Charlie is conflicted by a shocking discovery. Hallucinations complicate the trek to Philadelphia. Nora and a close relative cross paths and she has to choose between keeping a promise or family. A brutal Militia member is tracking Miles, Charlie and the gang. General Monroe warns Captain Neville. Charlie relates to a boy with a similar story and is determined to help him and his young friends. But first she must get the approval from Miles. Meanwhile, Rachel grows weary of General Monroe as she meets someone from her past. In an effort to save Nora from her injury, Miles takes the gang on a detour to visit an old acquaintance for medical support. But things don't go as planned when they find themselves in unfriendly territory. Meanwhile, Neville delivers Danny to Monroe. Charlie and Miles discover Militia are using a forgotten technology to their advantage. Charlie and Nora rescue Miles from Militia and reunite with Aaron and Maggie. Danger awaits as the group continues on. In an effort to escape the militia, Nora leads Miles and Charlie back to the Rebel camp. Meanwhile, Aaron and Maggie search for Grace, and Danny defies one of Captain Neville's men. In his efforts to save Danny, Miles leads Charlie to a Militia prison camp to rescue Nora, a rebel fighter who happens to also be his ex. The series opens with an unlikely trio attempting to do the impossible - save the world. If you've been watching NBC's new shows, here's some good news for you: three of them have gotten full-season pickups and will continue through to spring 2013! The new series "Revolution," from J.J. Abrams, kicks off with this pilot episode in which we're introduced to a family living in a world without electricity. Was the episode any good? Find out here. Watch the New Show 'Revolution' Online (For Free) Right Here! 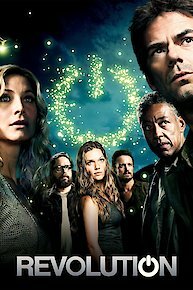 Get a head start on the fall season by watching the pilot episode of "Revolution" right here, for free. Is NBC's new post-apocalyptic sci-fi show a good one? Find out now! Revolution is currently available to watch and stream on NBC. You can also buy, rent Revolution on demand at Amazon, Vudu, FandangoNow, Google Play, iTunes online.